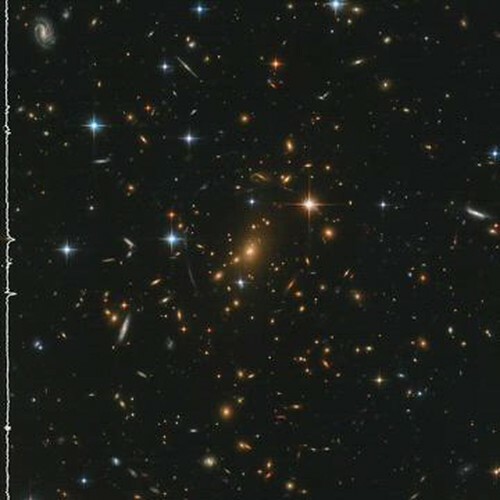 Space becomes “sonified” in this visualization of a cluster of galaxies imaged by Hubble. Time flows left to right, and the frequency of sound changes from bottom to top, ranging from 30 to 1,000 hertz. Objects near the bottom of the image produce lower notes, while those near the top produce higher ones. Most of the visible specks are galaxies housing countless stars. A few individual stars shine brightly in the foreground. Stars and compact galaxies create short, clear tones, while sprawling spiral galaxies emit longer notes that change pitch. The higher density of galaxies near the center of the image — the heart of this galaxy cluster, known as RXC J0142.9+4438 — results in a swell of mid-range tones halfway through the video. Hubble's Advanced Camera for Surveys and Wide Field Camera 3 acquired this image on Aug. 13, 2018.